Don't miss the new podcast and online slideshow featuring Georgina Ferry discussing her book and Max Perutz. 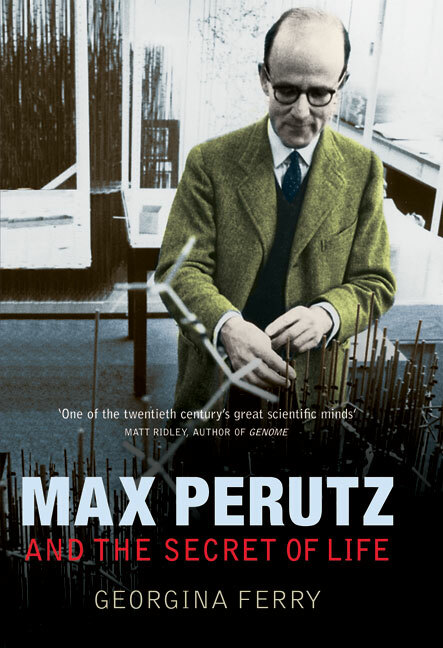 Few scientists have thought more deeply about the nature of their calling and its impact on humanity than Max Perutz (19142002). Born in Vienna, Jewish by descent, lapsed Catholic by religion, he came to Cambridge in 1936 to join the lab of the legendary Communist thinker J.D. Bernal. There he began to explore the structures of the molecules that hold the secret of life. In 1940, he was interned and deported to Canada as an enemy alien, only to be brought back and set to work on a bizarre top secret war project. In 1947, he founded the small research group in which Francis Crick and James Watson discovered the structure of DNA: under his leadership it grew to become the worldfamous Laboratory for Molecular Biology. Max himself explored the protein hemoglobin and his work, which won him a Nobel Prize in 1962, launched a new era of medicine, heralding todays astonishing advances in the genetic basis of disease. Max Perutzs story, wonderfully told by Georgina Ferry, brims with life. It has the zest of an adventure novel and is full of extraordinary characters. Max was demanding, passionate and driven but also humorous, compassionate and loving. Small in stature, he became a fearless mountain climber; drawing on his own experience as a refugee, he argued fearlessly for human rights; he could be ruthless but had a talent for friendship. An articulate and engaging advocate of science, he found new problems to engage his imagination until weeks before he died aged 88. About the author: Georgina Ferry is a former staff editor on New Scientist, and contributor to BBC Radio 4s Science Now. Her books include the acclaimed biography Dorothy Hodgkin: A Life (1998); The Common Thread (2002, with Sir John Sulston); and A Computer Called LEO (2003). She lives in Oxford. Perutz made a wise choice when he chose to invite Georgina Ferry to write his life. The result is an engaging, beautifully written book deserving a place on the shelf of everyone who likes to read about science and scientists. Ferry takes Perutzs career through to the end of his life with his work on the amyloid associated with Alzheimers disease. Whether dealing with personal matters or explaining the science, Ferry handles the subject matter with ease and clarity.